This Wheelchair Leg Hugger by Posey fits 18 to 20 inch wide wheelchairs. It mounts flush with footrest hangers to allow full use of footrest. Patients with wheelchairs face the issue of their feet slipping off the footrests. This can cause discomfort and entangling under the chair. An excellent remedy to this issue is a simple pad like this product to help prevent the feet from slipping off. The Wheelchair Leg Hugger is convenient in it's design with it's wipe clean covering. The pad itself is made of cushioned foam padding that is covered with this wipe clean vinyl. This makes it ideal for patients that are at risk of accidents from either incontinence or other instances such as beverage spills. The foam padding on this Wheelchair Leg Pad provides additional padding and comfort for patients. It mounts flush with the footrests to allow the footrests to be fully used. This Wheelchair Accessory prevents feet from slipping off of the footrests or becoming entangled under the chair. 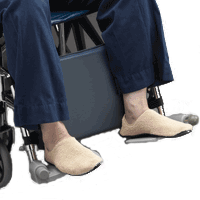 Recommended Use: Patients needing lower extremity support and/or Leg Protection.